Israel Prime Minister Golda Meir once declared, “I must govern the clock, not be governed by it.” While she was referring to peace with Arab nations, scientists have been working to understand the mechanisms of our body’s own internal clocks, called circadian rhythms, in an effort to control any malfunctions that could be contributing to the rise in obesity, diabetes, heart disease, and other health conditions. Last month, a finding from Brigham and Women’s Hospital and the University of Murcia in Spain determined that dieters who ate their largest meal earlier in the day lost 25 percent more weight than those who consumed it later in the day — likely due to the timed fluctuations in the body’s metabolic rate and in hormones responsible for storing energy as fat. Other recent experiments with mice suggest that snacking on fatty snack foods during normal sleep time produces obesity even when overall calorie consumption remains unchanged. And previous studies have established the health risks of night shift work: increased rates of heart disease, obesity, diabetes, and certain cancers, that are thought to be caused by a chronic body clock confusion. With this accumulating evidence, chronobiologists who study circadian rhythms worry that we’re damaging our health by engaging in frequent overseas travel and a regular pattern of working, snacking, and staring into bright screens well beyond our body’s preferred bedtime. “Has circadian misalignment contributed to the rise in obesity and diabetes? This is hard to prove, but all evidence points toward negative health consequences of disturbances in circadian rhythms,” said Frank Scheer, director of the medical chronobiology program at Brigham and Women’s Hospital. Quiz: Are you a lark or a night owl? Circadian rhythms vary naturally from person to person. Take this quiz and add up the points next to your answers. An animal study released last week in the journal Current Biology provides more strength for these claims. The research, conducted in mice by a team of Vanderbilt scientists, found that insulin, which regulates carbohydrate and fat metabolism in the body, follows a 24-hour cycle. Cells are relatively resistant to insulin when mice are asleep and fasting, the study showed, with sugar primarily converted into fat, rather than energy. This could mean that snacking just before bed is particularly bad for the waistline, according to the authors. As researchers tinker in labs with experimental drugs designed to synchronize circadian rhythms in those who have disruptions due to genetic conditions or erratic work schedules, there are certain steps you can take — like eating, sleeping, and exercising on a predictable schedule — to keep your clocks running on time and in sync. 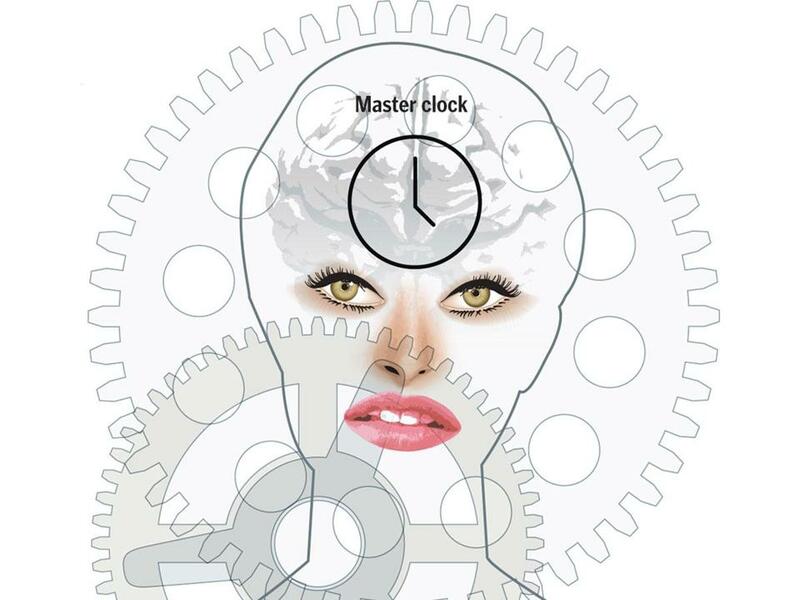 The body tells time in numerous ways, primarily sensing day from night by light passing through the eyes into the retina, which sends signals to the brain’s master clock — a group of nerve cells called the suprachiasmatic nucleus, or SCN. This structure sends messages to the body’s hormonal and nervous systems, signaling the brain’s pineal gland, for example, to release the sleep-inducing hormone melatonin at night in the absence of light and to shut off melatonin production at dawn. While the SCN also sends signals to the heart, brain, or liver — to rev you up first thing in the morning by increasing the hormone adrenaline and blood sugar levels — it also receives messages from tiny clocks within these organ cells, that also work on 24-hour cycles, to regulate metabolism. Scheer’s latest study, soon to be published in the journal Obesity, found that when people are studied in a lab setting — with controlled meals, sleep, and activity habits — they tend to experience the most hunger at around 8 p.m. and are the least interested in food first thing in the morning. This may help explain why some of us are bedtime snackers and not ravenous in the morning, even though we haven’t eaten the whole night. In the study published last month, Scheer and his colleagues gave 420 overweight Spaniards a Mediterranean-style eating plan — based on fresh produce, legumes, fish, and whole grains — to help them lose weight. While the amount of calories consumed and burned throughout the day didn’t differ significantly among the early and late eaters, the early eaters lost 22 pounds after 20 weeks compared with 17 pounds for the late eaters. “It was really the timing of the main meal that predicted the success of the diet independent of calorie intake or estimates of energy expenditure through exercise,” said Scheer. In a study published last year, researchers from the Salk Institute found that mice fed a high-fat diet during their normal waking hours were protected from diabetes and obesity compared with those fed the same diet with the same number of calories over 24 hours. Those findings could lead to new weight loss drugs that manipulate the timing of hormone fluctuations. “There is a cyclic clock protein that acts as the brakes on sugar production in the liver. This protein is low at the end of the night, when we have been ‘fasting’, and allows the liver to produce sugar in preparation for activity as we awake,” said Steve Kay, a professor of biology and neurology at the University of Southern California. His lab is testing a drug that increases this clock protein to see if it can reverse obesity by preventing this rise in blood sugar. Perhaps most pressing is the need to more fully understand the impact that erratic body clocks have on disease risks. In a 2009 study, Scheer and his colleagues recruited 10 healthy volunteers to live in a lab at the Brigham for 11 days on a 28-hour daily cycle with no natural light or other time cues from the outside world. “Their internal circadian system was never able to adjust to this regular 28-hour sleep-wake cycle during the study,” Scheer said. Besides sleep disruptions and moderately increased blood pressure, those with continuously out-of-sync clocks experienced a sharp rise in blood sugar and the hormone insulin, which is a risk factor for diabetes. Three of the participants had blood sugar levels that put them into full-blown insulin resistance or pre-diabetes within the first three days of study, a condition that reversed after the end of the study. Those findings don’t bode well for those who confuse their body clocks with frequent travel across time zones or night-shift work. And it raises concerns about possible health risks faced by a significant percentage of the population who have naturally disrupted circadian rhythms. About 10 percent of the population have strong morning or evening preferences in their circadian rhythms, making them night owls or larks. About a third of these folks are at the extreme end, having a sleep disorder that makes their bodies yearn for sleep early in the evening or several hours past midnight. These genetic tendencies can make their sleep habits seem downright wacky in our culture that expects most office workers to arrive at around 9 a.m. — not at 4 a.m. or noon. Often misdiagnosed as having insomnia, people with a condition called delayed sleep phase syndrome feel chronically jet-lagged, as if they are set on Hawaii time while living in Boston. Those with advance sleep phase syndrome feel as if they’re on European time, or on an earlier schedule. Treatment for a delayed sleep phase often involves nudging the clock ahead hour by hour over days or weeks. Patients use a light box that mimics outdoor light at a scheduled time in the morning, starting around when they would naturally wake up, and getting progressively earlier every few days. They also take melatonin supplements a few hours before their scheduled bedtime to send their brain a message that night has arrived. Treatment for advance sleep phase is similar, but with light therapy given later in the morning and melatonin later at night. @globe.com. Follow her on Twitter @debkotz2.